Na Yeon Choi walks with her caddy to hole 2 during the first round of the US Women’s Open at Lancaster Country Club on Thursday, July 9. Na Yeon Choi tees off on the 18th hole during the first round of the US Women’s Open at Lancaster Country Club on Thursday, July 9. Na Yeon Choi sinks a putt for birdie on 16 during the first round of the US Women’s Open at Lancaster Country Club on Thursday, July 9. Na Yeon Choi hits from a bunker on the 14th fairway during the first round of the US Women’s Open at Lancaster Country Club on Thursday, July 9. Na Yeon Choi watches her tee shot on 2 during the first round of the US Women’s Open at Lancaster Country Club on Thursday, July 9. Lexi Thompson hits her second shot on 16 during the first round of the US Women’s Open at Lancaster Country Club on Thursday, July 9. Lexi Thompson hits from the fairway of hole 15 during the first round of the US Women’s Open at Lancaster Country Club on Thursday, July 9. Lexi Thompson hits from the fairway of hole 14 during the first round of the US Women’s Open at Lancaster Country Club on Thursday, July 9. Lexi Thompson chips onto the green on hole 11 during the first round of the US Women’s Open at Lancaster Country Club on Thursday, July 9. Lexi Thompson, bottom left, walks up the 18th fairway during the first round of the US Women’s Open at Lancaster Country Club on Thursday, July 9. Lexi Thompson tees off on the 18th hole during the first round of the US Women’s Open at Lancaster Country Club on Thursday, July 9. Lexi Thompson tees off on 17 during the first round of the US Women’s Open at Lancaster Country Club on Thursday, July 9. Lexi Thompson putts on 16 during the first round of the US Women’s Open at Lancaster Country Club on Thursday, July 9. Lexi Thompson reacts after missing a birdie putt on 14 during the first round of the US Women’s Open at Lancaster Country Club on Thursday, July 9. Lexi Thompson tees off on 14 during the first round of the US Women’s Open at Lancaster Country Club on Thursday, July 9. Lexi Thompson tees off on the 3rd hole during the first round of the US Women’s Open at Lancaster Country Club on Thursday, July 9. Lexi Thompson can’t get a birdie putt to drop on hole 2 during the first round of the US Women’s Open at Lancaster Country Club on Thursday, July 9. Lexi Thompson lines up a putt for birdie on 2 during the first round of the US Women’s Open at Lancaster Country Club on Thursday, July 9. Lexi Thompson tees off on 13 during the first round of the US Women’s Open at Lancaster Country Club on Thursday, July 9. Lexi Thompson can’t get this birdie putt to drop on 17 during the first round of the US Women’s Open at Lancaster Country Club on Thursday, July 9. Lexi Thompson tees off on 15 during the first round of the US Women’s Open at Lancaster Country Club on Thursday, July 9. Lexi Thompson lines up a putt for birdie on 14 during the first round of the US Women’s Open at Lancaster Country Club on Thursday, July 9. Lexi Thompson follows through on her tee shot on 2 during the first round of the US Women’s Open at Lancaster Country Club on Thursday, July 9. Behind the third hole is a staging area where players were taken off the course due to impending weather during the opening round of the US Women’s Open at Lancaster Country Club on Thursday, July 9, 2015. A portable TV platform was taken down due to impending weather during the opening round of the US Women’s Open at Lancaster Country Club on Thursday, July 9, 2015. 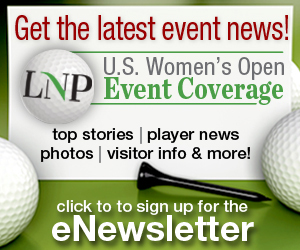 Marina Alex talks during a press conference following her finish at four under par in the first round of the 2015 U.S. Open at Lancaster Country Club Thursday. Karrie Webb talks during a press conference following four under par finish in the first round of the 2015 U.S. Open at Lancaster Country Club Thursday. Marina Alex makes her approach shot on 18 in the first round of the 2015 U.S. Open at Lancaster Country Club Thursday. Suzann Pettersen tees off on 15 in the first round of the 2015 Women’s Open at Lancaster Country Club Thursday. Michelle Wie watches her shot on the nineth hole at Lancaster Country Club during the first round of the 2015 U.S. Open Thursday. Michelle Wie putts on the #9 green at Lancaster Country Club during the first round of the 2015 U.S. Open Thursday. Haley Italia looks over the #10 green at Lancaster Country Club during the first round of the 2015 U.S. Open at Lancaster Country Club Thursday.